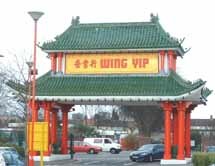 The Wing Yip Centre on the Purley Way was a truly great addition to the Croydon shopping scene. It's a difficult choice when it comes to deciding where to place it within Croyweb; it's a venue with restaurants, gift shops and Chinese lawyers; it's a supermarket from another world; and it's a bargain hunter's paradise. We started visiting Wing Yip a few years ago after receiving some Chinese cook books as presents - (what do you get the man that nearly has almost nothing?). A kick-start was needed in the larder department so Wing Yip became the prime target, a voyage into the unknown! The main entrance is a well-known land-mark in Croydon now, rated alongside the towers of Ikea, but its incredible how you can take these things for granted. When it's on your door-step there's always next week. Our main port of call is the super market. Roughly the size of British supermarkets in the eighties, (say Sainsbury's in Purley), it's not massive, but for a single nationality outlet it's incredible. Now if Croydon had an Indian equivalent surely they'd have made us a city, perhaps even re-opened the airport? Digression. Even a few years on, and having become experts in all things to do with Chinese food - let's start that again. A few years down the line and having learnt a lot about Chinese food we're still constantly amazed at the variety and quantity of products at Wing Yip that we simply don't understand. Couple two phrases; learning is a voyage of discovery; and it's better to travel than to arrive; and you get close. We pop into Wing Yip for a cheap bottle of Soy Sauce and some spring rolls and two hours later we emerge wide eyed, (sometimes wild eyed), with a trolley full of produce for fifty quid. There are fruit juices on sale that we can't find in the dictionary; there are oils, sauces, spices and ingredients that we can only guess at. There's a lot of it as well. But at these prices you can afford to experiment. Bargain hunter time. A 20kg sack of onions is just under £4.00, and that means about 20p per kilo. It's 5 times more at Tesco/Sainsbury, so even if you give 15kg of big Spanish onions away to your onion loving mates you're still doing well. In fact nearly all the products available in the store are also available out the back in the warehouse in wholesale quantities. Like Hoi Sin sauce? Buy 12 jars at once and pocket the savings. There are sacks of rice, racks of those beers you like in the restaurants, and all things good in life! Back out in the main supermarket there's a huge range of cooking utensils, bowls, plates and tableware, all at knock-down prices and many of them nothing short of a work of art. Notice we didn't add eating utensils - chop sticks a plenty though. 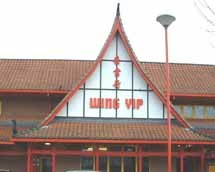 At Wing Yip 90% of the customers and staff are Chinese. The atmosphere is calm, relaxed and unhurried, you can take all the time you like trying to work out what the unfamiliar concoctions are and you won't get jostled, (after all this isn't quite Croydon this side of the doors). Kids don't scream and trolleys never bounce, it's like Britain 20 years ago, (so a friend told me). When you eventually arrive at the check-out it's time for the first culture shock of your visit. The staff unload your trolley and pass it through the till, then bag it up and repack your trolley. It's a bit weird, but when you get used to it, it's unbelievable luxury. If you're paying by credit or debit card, the check-out girl passes you your receipt and you pay at a small desk to the rear of the till. It's all so civilized you kick yourself next time you find yourself at our traditional USA equivalents - roll on Walmart! Whether it's buying bean sprouts and pak choi flown in fresh from China, or watching the lobster and crab swimming live (and for sale) in the large aquariums, Wing Yip is a real experience. Whether it's Chinese expats meeting up and saying hello to one another, or restaurant owners zooming through from the warehouse section, you know these people are happy shopping here and you can therefore buy in confidence. You don't have to speak Chinese, but you do have to be polite, believe me we can still do it if we try. They're friendly too - all our photos were taken with the help and advice of their trolley collector. Try that at some of the UK stores and if you've still got a camera on your way home you'll probably have some pretty weird pictures!